These days, it seems days that the construction industry is getting the upper hand on creativity and art. Whatever the project, the industry seems to come up with an idea that beautifies the result. Surprisingly, that is even true of concrete. Colorized and textured concrete are becoming common and provide a beautiful and innovate touch to floors. Considered among the best techniques a comparison between Knockdown vs. Handtrowel highlights the artistic approaches used to make concrete sparkle like eye candy. Knockdown is pretty much what it says. The contractor or mason knocks down high points appearing on the flooring’s face. That may sound strange after a pouring, but a spraying or direct application of additional concrete (or a compound) is added — usually within 28 days. As the cement cures, the surface and the sprayed or applied concrete bond, creating a unifying single surface. Before the curing process is complete, the high points created by the sprayed or applied concrete/compound, are knocked down and the desired texture appears. The appearance is much like knockdown drywall. The flat version, or a California knockdown, is the most common texture design applied to cement flooring. The attributes of this flooring technique are multiple. Beyond just providing various, appealing colors with a textured surface, there are several advantages to this technique. The flooring creates more friction reducing incidents of slippage. This is important around pools and other like areas. The surface remains cooler and during summer, especially in arid regions, the impact of this feature is compelling. With the trowel surface, there is clearly a handcrafted result, giving it an artisan’s touch. Both techniques try to provide a beautiful but functional surface. In the case of a hand-troweled surface a very important aspect is how it challenges densification. That is pushing air away from the surface to create a harder surface. Passing the steel trowel over the surface several times creates a burnish and further passes of the steel trowel can give the surface a mirror like appearance. This latter approach does not serve well outdoors because of the slippage factor, despite its appeal. The ultimate look can appear plain and flat, per above, but nowadays texturing is so popular that the added touch of the hand-trowel to create a unique surface each time makes it an appealing surface for both indoor and outdoor flooring. Concrete has come into widespread use as a result of the artistic applications so easily applied to its surface. Once consigned to garage floors, sidewalks, and large public spaces, the material has found renewed interest by the public within the walls of their homes and surrounding areas. 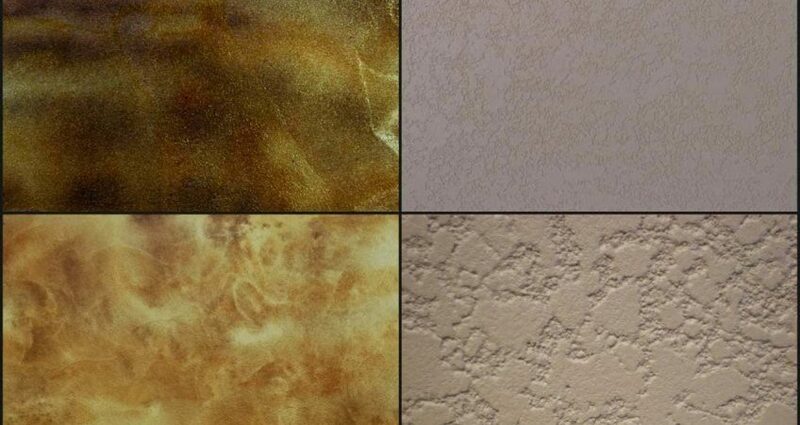 Color and texture has proven a prime impetus driving it use and popularity to its highest levels. With that comes a responsibility to preserve these surfaces, providing for the continued beauty, utility, and longevity such surfaces provide. Without the help of maintenance and waterproofing techniques, however, like all materials cement surfaces can experience failure. Mostly, that failure comes through water. As in the case of the knockdown surface, it many little decorative pits and channels hold water. If allowed to sit unabated and evaporated, overtime the cement’s surface will weaken. An extra precaution demands waterproofing in this particular case. Even in the troweled flooring the same problem exists. It can come from water swelling up from underground, changes in the weather from warm to freezing etc. It represents on ongoing battle and early treatment by waterproofing products with an earned reputation is the only answer. Prolonging your beautiful flooring surfaces serves to protect what always proves to be a good investment. Contact us, Pli-Dek Systems, to learn more about the various functional and beautiful surfaces that concrete has to offer in addition to a concrete waterproofing system.